Courtney Mann, ETC: Meet Gert. I've been extremely busy lately!! 3) Going on two float trips here! 4) Relaxing in the pond on my pool floatie. 5) Hitting up numerous Cardinals games in the Lou! Adorable pig. My dad rescued a pig once on a fire call and brought it home. The pig took over the dog's doghouse and rooted up all my mom's flowers. Haha! Yes she is kinda like that. She lives in a dog Kennel and loves to dig around in the yard! 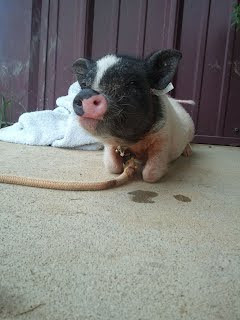 You know you could be apart of a Jeff Foxworthy joke when... you have a pig! She is cute! Summer is a great time of year. Enjoy it! Read, tan, travel, grad school, that is what I am doing. Gert is a cutie! I'll be spending a lot of my summer on the lake! We love to swim and tube! I'm back haha! I just wanted to let you know that I love your blog! So, I've given you the One Lovely Blog Award! Stop by my blog to see all of the details in my latest post! You might be a redneck right;) I need to be doing grad school! Lacking some motivation--send some my way?